This Crochet Easter Basket just makes me happy. I love the cheery colors and the little Easter bunny peeking over the top of the basket! 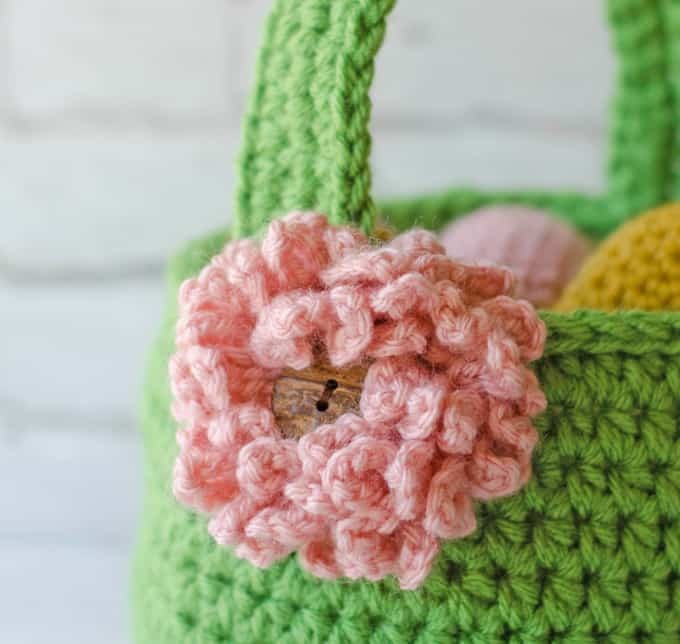 It sings of spring and all the goodness spring brings to the world!This crochet easter basket is part of a 3-part Easter series. In the first part, we made Easter eggs. 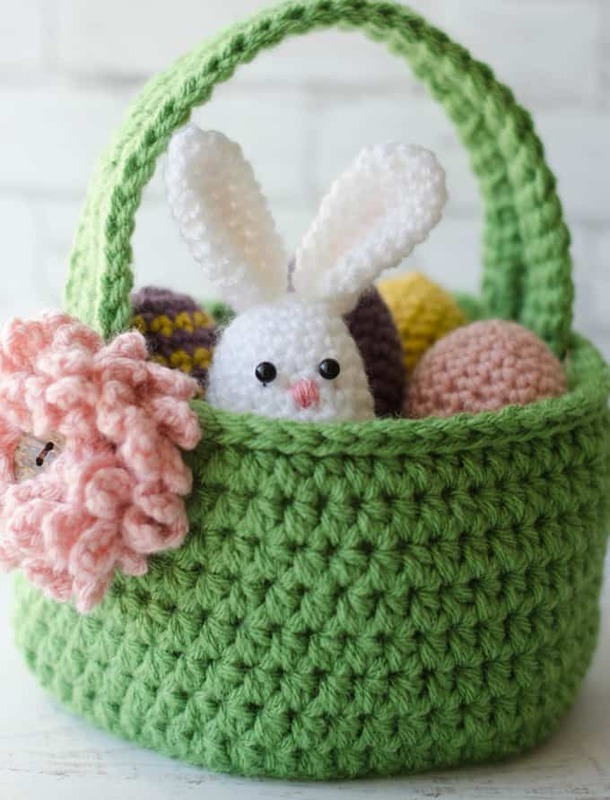 This post is all about the crochet basket and the final post shows you how to make the cutie easter egg bunny. If you don’t want to wait, you can get all 3 patterns together in one ad-free bundle right now! Basket is approx 9” tall including the handle (4” tall excluding the handle). The diameter of the bag is approx 6.5”. With green yarn and holding 2 strands together throughout, make a magic ring. R1: 6 sc into ring (6 sts). Work in rounds. Now you will work up the sides of the basket, continuing to work in the round. R18: sc in 1st st, then working in the front loop only, sl st in ea st around. Sl st into 1st sc of the round. Fasten off and weave in ends. Using pipe cleaner will allow the handle to hold it’s rounded shape. However it is optional. With green, and holding 2 strands together throughout, chain 35. Sew each side of the handle on the bag across from each other. Sew on tight, inside the basket, just under the sl st border stitches. Weave in any ends. 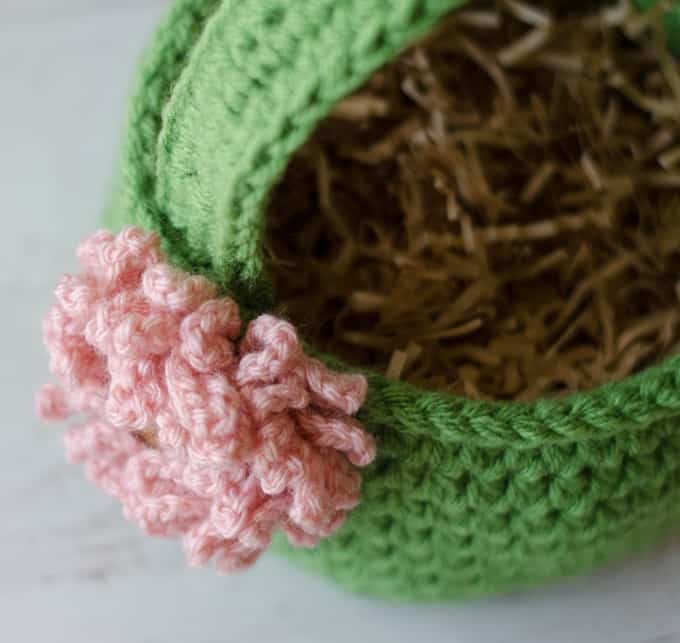 The flower for this crochet Easter basket is made following the Loopy Flower Pattern here. Using pink, make loopy flower. Sew button, if desired, in center of flower, with needle and sewing thread. Then attach flower to basket, using yarn and tapestry needle. 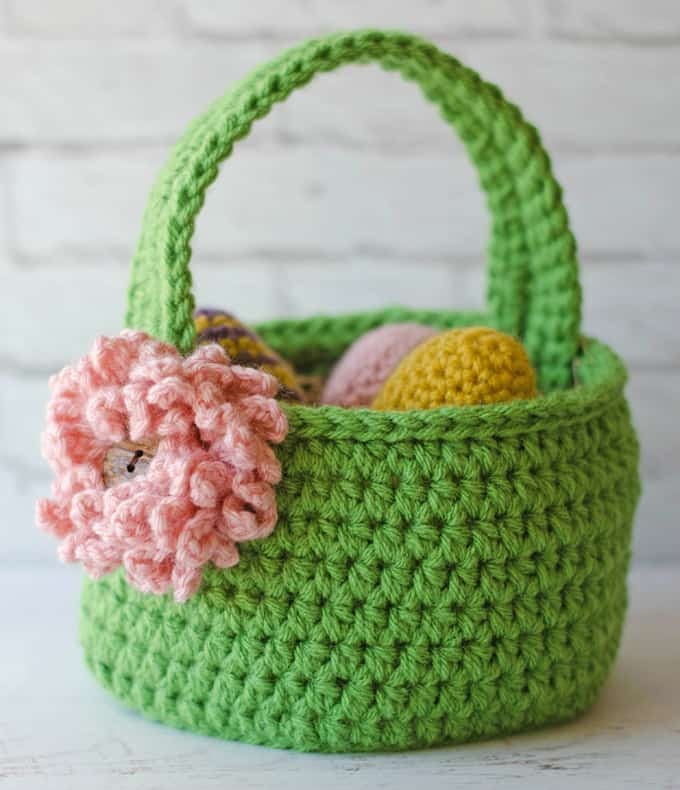 Fill basket with Easter Grass and place the Crochet Easter Eggs in the basket. Part 3 will show you all the details to make the cute Easter Egg Bunny! Purchase an ad-free printable version of all 3 patterns in one! I love seeing your finished projects! If you share your Crochet Easter Basket on Instagram, be sure to tag me @crochet365knittoo. If you are on Facebook, stop over to the Crochet 365 Knit Too Facebook page and share a photo! I’d love to see your work! Written pattern copyright Cheryl Bennett 2018, all rights reserved. Please do not reprint or repost this pattern. 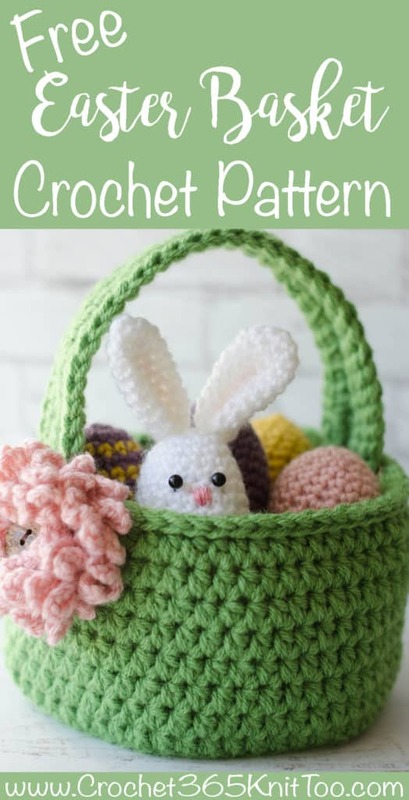 If you would like to share this Crochet Easter Basket pattern with others, just link to this page. If you’d like to make items for sale from this pattern, please visit my About page for more information. What size is this basket? Basket is approx 9″ tall including the handle (4″ tall excluding the handle). The diameter of the bag is approx 6.5″.